Port Bimbi Pty Ltd understands that privacy is important to all its clients and customers. Personal information retained by this company is not passed on to any third party at any time. Port Bimbi Pty Ltd will collect information from customers to enable shipment of the Schools Guide only. No credit card details are stored by this website. All payments are accepted via PayPal. Other details are retained for payment and/or delivery purposes only and are not passed on to any third parties. Port Bimbi Pty Ltd may respond to general enquiries via email, telephone or facsimile. Personal information is retained for reply purposes only. No personal information will be made available to any interested parties and only School information which is readily available within the Schools Guide Magzazine and/or this website will be passed on. 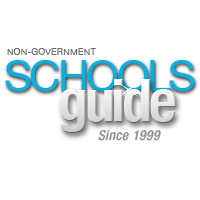 Schools Guide does not provide any data appearing on this site as a downloadable file, spreadsheet or similar format. From time to time Port Bimbi Pty Ltd may publish a newsletter regarding the Schools Guides. This may be forwarded to all advertisers in the Guides automatically via email unless requested not to do so. Other interested parties may request and receive the newsletter by emailing your request. Schools Guide provides a limited helpdesk service to assist users in narrowing down schools that may be suitable for their needs. Schools Guide does not rate or rank schools and does not receive any payments, recompense or reimbursements from any school for being suggested by this service. This service is intended for general assistance only. In most cases a range of likely suitable schools will be suggested. These schools may not be an exhaustive list and may not be the most suitable for a particular child. Individuals and families should do their own research before enrolling at any school. Many school pages appearing on this site contain a rating system allowing visitors to the site to post a rating for each school. Ratings are scored from 0 to 6 stars with six stars reperesenting what that visitor considers to be a World Class school. The system is designed to allow a single vote per school per visitor per session to avoid having visitors rate schools overly unfairly or excessively and allow the site to, progressively over time, portray the average rating given by a wide number of different vistors. Ratings do not necessarily represent an accurate value of, or quality of, any school and should not be regarded as an accurate portayal of a school's capacity to educate or otherwise school a child. All ratings appearing on this site are entirely independent scores provided by the visitors to this site as they see fit. Those visitors may or may not have an accurate understanding of the school and may or may not score impartially. Parents should not use the ratings as a guide to what constitutes a good school or otherwise. Port Bimbi Pty Limited does not take responsibility for the accuarcy or reliability of the scores presented other than to provide a working system that accurately accounts for the votes as entered by each individual who has visitied the pages of this site and has taken the opportunity to offer a rating. Should any school have a concern regarding its rating Port Bimbi Pty Ltd encourages it to use its login (every school on this site is enabled with a free login which enables the school to fully manage their content) and simply disable the Ratings system for their page. Please contact Schools Guide staff if you do not know your login details or would like instructions on disabling your ratings system. Alternatively, please feel free to contact Schools Guide staff at any time and request your ratings be disabled. If you believe your ratings have been represented inaccurately please feel free to request a reset. Schools Guide staff hope that every school is rated fairly and where errors occur or inaccuracies are evident we will happily reset any school's rating. Where a reset is performed the system will return to a score of 0 ratings from a total of 0 users for that school. On that school's page it will show 6 blank stars representing a score of 'not yet rated' until such a time as a visitor places a new vote. To the extent permitted by law, Port Bimbi Pty Ltd will not be liable in any way (including for negligence) for any loss, damage, cost or expense suffered or incurred by you or claims made against you through your use of this Site, the unavailability of this Site or in connection with any products, services or information advertised, offered or supplied through this Site. Please feel free to place a link to this website on your own site. Australia's premier private schools directory. School profiles, Open Days, school videos, school reviews, school maps, images and contacts. Generally we will only place school-related links or links of interest to parents and students on this site, however please feel free to contact us if you have another type of site link in mind.